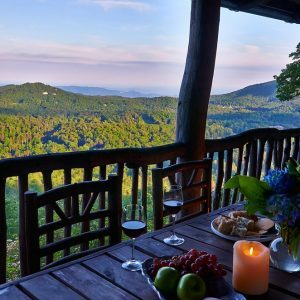 In the final chapter of our series of Best Western North Carolina towns to buy a vacation home: Sapphire Valley. A popular community located between Cashiers and Brevard on US Highway 64 in the heart of the “Land of Waterfalls.” In the mid-1800s, gold, sapphires and other gemstones were found in the area, and the ensuing gem mining trade put Sapphire Valley on the map. Centered around Fairfield Lake, Sapphire Valley offers hiking, a zip line, and easy access to winter snow sports. The town is also home to the well-known Wyndham Resort at Fairfield Sapphire Valley, which offers a slew of amenities. The Sapphire Mountain Brewing Company, a pub overlooking the Sapphire National Golf Course is a popular place to get a beer and take in the views. Table 64, a wine bar and tapas experience. Mica’s, cozy pub with a covered patio, fire pit, and live music. The Cork & Barrel, a causal lounge next to Table 64, serving wine, beer, cocktails and tapas. The Library Kitchen, an historic restaurant featuring seasonal ingredients. Underwent a complete renovation in 2016, with art installations by Marvin Gralnick. The heart of Sapphire Valley is Fairfield Lake, a 55+ acre mountain lake with an inviting shoreline and swimming beach, boathouse, dock and rentals. Hogback Lake and Sapphire Lake are also well-loved area destinations. Sapphire Valley is a popular hiking destination, known for Gorges State Park. Gorges is a temperate rainforest, and with an an elevation that rises 2,000 feet in four miles, it’s home to some of the most gorgeous waterfalls around. Sapphire Valley Ski Resort offers winter residents and visitors the opportunity to ski, snowboard or enjoy Frozen Falls — the tube park. 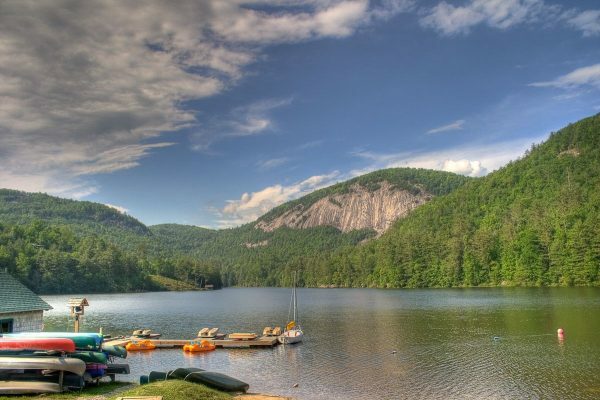 Lake Toxaway is the largest private lake in North Carolina, with 14 miles of shoreline at 3,010 feet elevation. A truly sparkling lake, it’s fed from streams high in the Nantahala and Pisgah National Forests. The Country Club of Sapphire Valley’s 18-hole golf course was designed by George C. Cobb and opened in 1956. It combines the vistas of a high mountain valley with the playability of a traditional, level course. The club also offers croquet and tennis. Lake Toxaway Country Club is home to the Kris Spence-designed 18-hole golf course, the 20-acre Tom Fazio Golf Learning Center, tennis courts, and world-class croquet facilities. A great public option for golf is the Sapphire National Golf Club, which recently completed a multi-million dollar renovation. See the homes currently for sale in Sapphire Valley.